This is a fascinating true story of determination, mortal danger, and success. 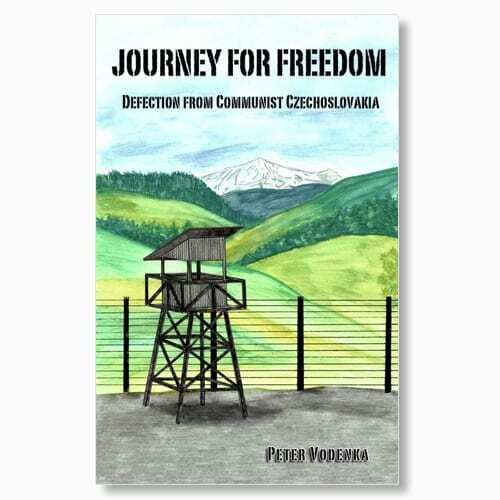 After ten years of planning and preparations, the author, then twenty-seven years old along with his twenty-four year-old wife, and their four and two year old children defected in the middle of a cold rainy night from behind the Iron Curtain of Communist Czechoslovakia to Austria, while being chased by guards with automatic weapons. Their own government would rather see them dead than to be free. They left everything and everybody they loved behind and risked everything, including their own lives for a chance to live a life of freedom in the United States of America. They chose not to tell any family members about their plans in order to protect them from the wrath of their own government, which they knew would follow if their escape was successful. This story comes from the dreams of a teenage boy longing for freedom from an oppressive government in a small foreign country to living a free life in America and the opportunity to call the American flag his flag, and the Star Spangled Banner his anthem. This story combines all the important components such as determination, hope, life threatening dangers, children, the struggle for freedom, new beginnings, hard work, and success.